Dayonix Pharma’s line of supplements aimed at improving the general health and wellbeing of people of all ages, using nutritious plant extracts, vitamins, minerals, amino and fatty acids, is coming to nutritional, health and beauty e-commerce platform VitaBeauti.com. 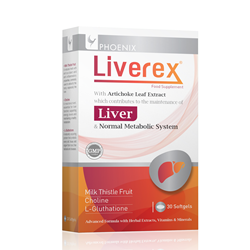 Liverex is comprised of milk thistle fruit, choline and L-gluthatione for liver and metabolic system health. We aim to provide a safe and effective alternative to those underserved by healthcare providers, and those who simply want natural supplements without side effects to better their overall health. The internationally acclaimed health-science company, based in Germany, produces both pharmaceutical products as well as natural, gluten-free healthcare products that aim to treat ailments and improve general health. Dayonix Pharma is bringing supplements to VitaBeauti.com that represent a fundamentally different approach to enhancing the quality of life. “We use similar standards for supplements as pharmaceuticals, to guarantee customers receive high grade products,” Dayonix Pharma Vice President Ricardo Correia said. “An unfortunate reality is that other companies produce supplements that are not backed by science or made to as high of standards. It is important that dietary supplements are of the highest quality and efficacy, because people who simply cannot afford expensive prescription drugs often purchase them. Dayonix Pharma produces its supplements to the highest of quality standards from the ground up at a state-of-the-art European facility that adheres to the EU’s regulations and policies. It has developed a reputation for its healthcare products and devotion to Corporate Social Responsibility, championing social and environmental causes. Dayonix Pharma is committed to open communications with consumers, employees, partners and the general public. It runs social media accounts, including Facebook and Twitter, to better serve two-way communication. VitaBeauti.com will receive Dayonix Pharma products: ActiMen, Adovit Multivitamin, Adovit Prenatal, Arthipass, Celofit, Crono, Dibetria, Irofix, Kidssi Multivitamin 6+ and Liverex. The Kidssi line of products is formulated for children. For more information on Dayonix Pharma and its products, coming to http://www.vitabeauti.com, visit http://www.dayonixpharma.com, and follow along on Twitter and Facebook.